Today, of course, is Thanksgiving; and the obvious question is, to Whom are we giving thanks, and why? Not surprisingly, however, many today studiously avoid answering the question. For them it is a time to get together with family and enjoy a turkey dinner with all the trimmings. Some even go so far as to call it “Turkey Day,” as if we needed a national holiday to celebrate a bird. The obvious answer to the question is, of course, that the purpose of the occasion is to thank God for all His blessings received during the past year. What is striking about this, however, is that this is a national holiday; and yet we have the separation of church and state in this country. How, then, can the state proclaim what is ostensibly a religious holiday? The deeper problem, however, is how modern Americans, with their increasingly secular outlook, can relate to their cultural heritage, in which Christianity played a prominent part. Thanksgiving Day, in fact, is a holiday that goes back to our very beginnings, and says a great deal about who we are, or least thought we were. The first Thanksgiving was celebrated sometime in October, 1621, by the Pilgrims. They were called “Pilgrims” because that was what they thought they were: “strangers and pilgrims on the earth” (Heb. 11:13; cf. I Pet. 2:11). They were members of a small religious sect in England that rejected the idea of a state church. The church, they believed, should be a voluntary association of committed Christian believers – a “believers’ church,” the communion of the saints. This was a radical idea at the time, and it brought upon them persecution. They were forced to live for a time as exiles in Holland. Eventually they hit upon the idea of migrating to the New World. Having obtained a patent from the Virginia Company, a group of investors in London, they sailed across the Atlantic in the Mayflower. Halfway across they encountered storms, lost their way (they couldn’t see the stars by which to navigate), and eventually sighted land at Cape Cod. At first they tried to head south, toward the mouth of the Hudson River which lay within the territory controlled by the Virginia Company, but were forced back by bad weather. They decided to settle at Plymouth. As it turned out the Indian tribe that had previously lived there had been wiped out by disease three years earlier. Because Plymouth lay outside of the territory controlled by the Virginia Company, but needing some form of civil government, the Pilgrims drew up the Mayflower Compact, and early experiment in self-government. They suffered through a difficult winter. And then one day in March, 1621 the unexpected happened. They were paid a visit by Samoset, an Indian who could speak broken English. Squanto, another Indian who could speak some English, came shortly afterward and lived with the Pilgrims briefly, and gave them valuable tips on fishing and agriculture. At the end of that summer the Pilgrims had much for which to be thankful. They had recovered their physical health, had erected some buildings, enjoyed friendly relations with the neighboring Indians, and had produced a successful corn harvest. Appropriately, then, sometime during that October they held a Thanksgiving celebration. Massasoit, chief of the neighboring Wampanoag tribe, along with 90 of this people, attended and stayed for three days. The Pilgrims had been through much, but as Cotton Mather was later to write, “They were indeed very often upon the very point of starving, but in their extremity the God of Heaven always furnished them with some sudden reliefs . . .” (Magnalia Christi Americana, I. iii. 1). Interesting there is an antecedent for Thanksgiving in the Jewish Feast of Tabernacles or Booths (Succot) which also is typically celebrated sometime in late September or early to mid October. The Jewish feast was meant to commemorate Israel’s wilderness journey through the Exodus, as well as to celebrate the ingathering of the year’s harvest. In both cases God had been gracious to Israel in preserving and sustaining them as a nation, and it was only proper and fitting that Israel acknowledge the fact. And so should we, this Thanksgiving season. God has blessed us with peaceful shores, abundant natural resources, and an unparalleled measure of political freedom. We are one of the richest, freest nations on earth. Most of us can scarcely imagine the grinding poverty and the political repression that many persons around the globe must endure. Should we not express our gratitude to God this Thanksgiving? The danger is that in the very midst of our material prosperity we will forget its ultimate source. God once warned ancient Israel about the dangers of prosperity and the temptation to say “My power and the might of mine hand hath gotten me this wealth” (Deut. 8:17). “But thou shalt remember the Lord thy God: for it is he that giveth thee power to get wealth, that he may establish his covenant which he swore unto they fathers, as it is this day” (v. 18). Should we not be thankful to God this Thanksgiving Day? WHY VOTE FOR A THIRD PARTY? 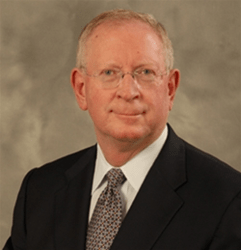 Darrell Castle, the Constitution Party’s candidate for President, has no chance of winning the current presidential election. So why, someone might ask, vote for him? First of all, in an election campaign in which two scoundrels are running against each other, it makes no sense at all to vote for one scoundrel just to keep the other scoundrel out of office. As the Clinton Foundation and Trump University make abundantly clear, neither major party candidate in this election is fit to occupy the highest office in the land. But are we not always in the position of voting for the lesser of two evils, it might be asked? The problem here is twofold. First of all, how can we really tell which is the lesser of two evils? The adulterer or the enabler of another adulterer? The one who mishandled confidential information on her private email server, or the one who stiffed his contractors? But secondly, what if both candidates are absolutely disqualified from holding office? If someone is fundamentally dishonest, routinely breaks the rules, and habitually takes advantage of others, he / she cannot be trusted with public office. That person lacks the character to lead the most powerful country in the world. As professing Christians the problem is especially acute. Can we excuse adultery and sexual assault in one candidate in order to prevent the other from pursuing the LGBT agenda? Can we pick and choose among the Ten Commandments, and argue that adultery is less serious than abortion? And by excusing the conduct of one who is openly immoral we betray our claim to be in favor of “family values” and “traditional marriage.” What happens to our testimony then? By why vote for a candidate who has no chance of winning the election? Isn’t that a wasted vote? Or even worse, a vote for the candidate we like the least? It must be remembered that there is more to democracy than simply getting this or that candidate elected to office. Ultimately it is the people who must decide the direction that the country should take. But that requires an open discussion of the issues. The pros and cons must be carefully weighed. And that, in turn, requires our political leaders to engage in open debate. The major parties, however, refuse to do that. Their aim is to win elections, and to that end they tell the voters what they want to hear. They avoid telling the electorate the hard facts about the federal deficit, for example, or the breakdown of the family structure. It is all promises, promises, promises. It typically falls to minor parties to address the real issues facing the nation, the issues that major parties do not want to touch. The Republican Party began as a protest movement against slavery. In the 1860 election Abraham Lincoln won only 40% of the popular vote. But he is commonly rated as one of our greatest presidents. The real problem facing America today is the breakdown of public morality. The sense of honor, integrity and duty has all but disappeared, and it has taken a terrible toll on family life. Putting an immoral casino operator in the White House will not “make America great again.” What is needed is a candidate whose words and actions speak of moral integrity and sound Constitutional principles. We need a party and a candidate that will be a clear voice for the principles that made America truly great: sound moral character, productive labor and the rule of law. What we need is a party and a candidate that will turn back to the vision of the Founding Fathers. That party is the Constitution Party, and that candidate is Darrell Castle. You waste your vote when you vote for someone who doesn’t believe in what you believe. Vote your conscience. Vote for Darrell Castle. Let your voice be heard!